I recently bought a 2 foot Kentia with one 3 foot frond from Etsy. It is 2 palms. On arrival, I noticed that there were black dots on the stalks , and other mild blemishes on the fronds. The pot was damaged and some of the soil was displaced. I wanted to repot it and use new soil and used this forum to look at various threads on potting mixes. I couldn't find pine bark, so I used fir bark. The mixture was roughly 30% FoxFarm Ocean Forest potting soil, 20% Fir Bark, 20% Hydroball (a Leca substitute), and 30% Pumice. I then watered it. 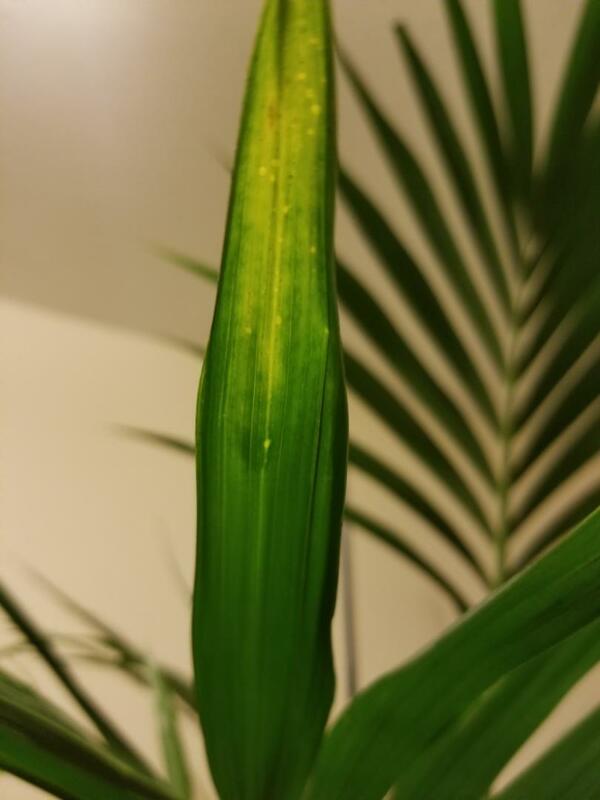 It seemed to dry out quickly, and after a few days I noticed yellowing tips on many fronds, so I googled "yellowing tips on palm fronds kentia" and it returned that it may be a sign of underwatering, so I watered it again 3 days later. Now I notice yellow transclucent dots on the tips of many fronds. I also notice a few dots of black circles within a yellowish halo -- may be fungus? 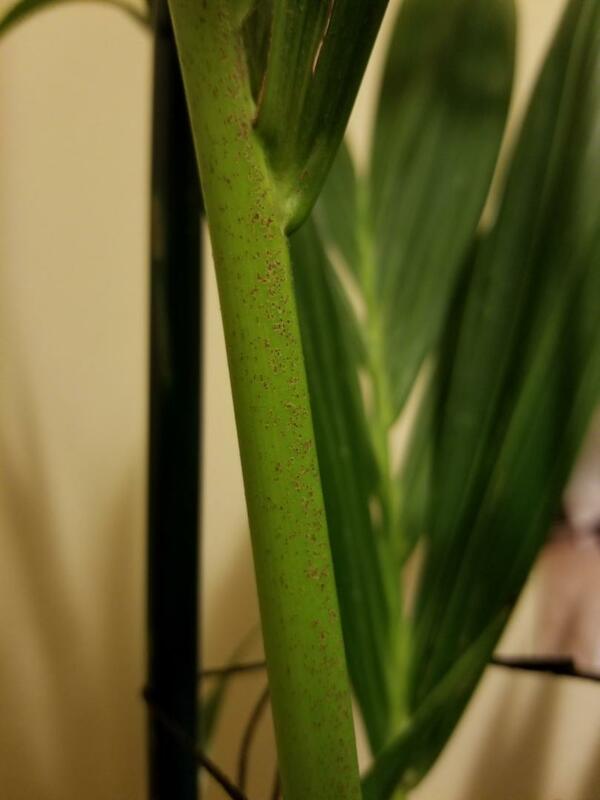 Is it fungus? Overwatering? Potassium deficiency? I also read that yellowing tips and circles at the tips may be a potassium deficiency? The Foxfarm is pH 6.3 - 6.8, but fir bark is acidic? I am new to houseplants in general -- I've noticed that I kill most plants through overwatering than anything....did I overwater? 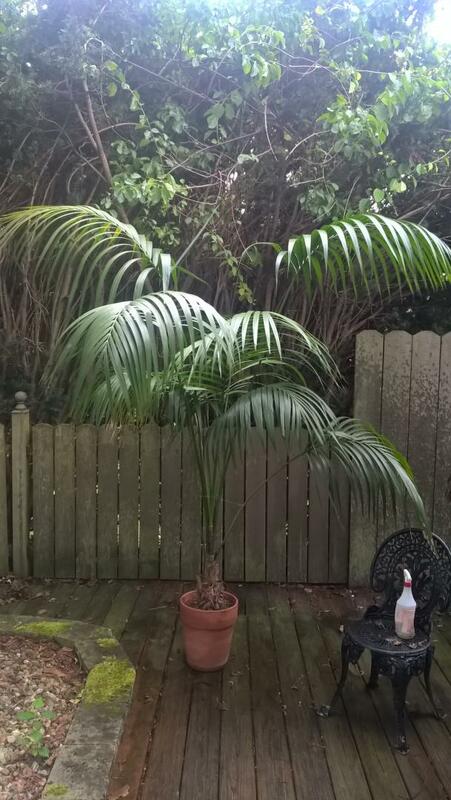 I picked the Kentia because it is considered the most hardy, plus, I really like the way the fronds curve, but she is my first palm. Any advice would be appreciated, thanks. Kariri, How is the Kentia doing? Out of curiosity, I checked my Kentias and noticed that some of them have occasional black marks similar to your photo. Likely, a bacterial spot and it could have occurred from growing conditions awhile ago. There are none on any of my recent fronds, so it has passed through that issue. I don't know what the other spots are. For the last pic, you may want to look through a magnifying glass to see if there are any red spider mites/webbing. The soil mix you are using sounds fine. It is better to error on underwatering them indoors than to overwater them. When you water, give a thorough, drenching watering, dump out the excess water from saucer and then do not water again until top 2" soil feels dry to touch. I wouldn't be too concerned about a nutrient deficiency - as long as you cover the basics (bright light, watering and regular fertilizing) I think the rest fall in line. I've been using a generic houseplant fertilizer (diluted every other watering) for over 20 years and mine have always seemed fine with that. Photo below of my Kentia that I have grown indoors (winter) for over 20 years. 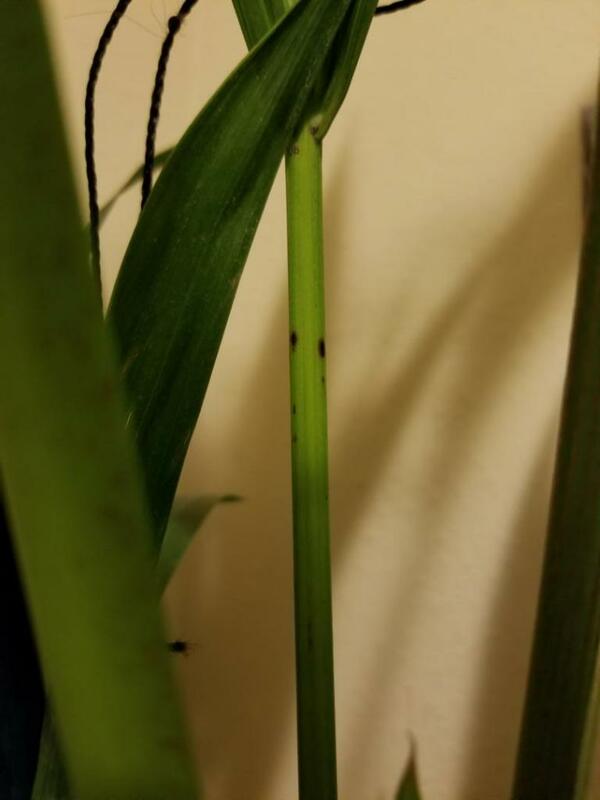 Lastly, you may want to use a black marker to mark the progress of the growing spear emerging from the center; check it each week. If the mark is moving upwards then you know it is growing. Keep us updated and let us know how it goes. PalmTalk has been a great place through the years and the members are what make it so. A member on here saw my post regarding the difficulty in getting Kentia in Florida and took it upon themselves to not only send me a small seedling....but a large plant! Feeling very grateful and appreciative and thought I would show some pictures of my newly aquired jewel. About 6 weeks ago, we bought 4 palms from the Home Depot in Laguna Niguel, CA. 2 are Kentias -- they were stored in the shaded part of the garden area -- not quite inside, not quite outside. Both looked healthy, but one was pretty overgrown for its pot (over 6' tall). The other Kentia is about 4' tall. The Pygmy date palms were stored in the outdoor, sunny part of the garden area. They're each 3 trunks, and about 3-4' tall. I live about a mile from the ocean, so the temperature doesn't generally get too hot. When we planted the trees, we added palm mix with the soil. Our regular soil has a lot of clay. Most of my neighbors have palms, especially pygmy date palms. Not sure how many have Kentias. The plants were doing pretty well for the first couple of weeks. At about the 3rd week, we had about a week long heat wave -- sunny all day and temps in the 90s. Since then, the larger of the Kentias hasn't looked too happy -- kind of droopy, and some of the fronds have died (we cut one off, and now another one is dead.) The other Kentia seems to be doing o.k. Also, for the Pygmy date palms, one of the plants has some brown fronds. The other one seems o.k. I'm attaching photos of the plants -- the first 2 pictures are of the trees that aren't doing very well. The last 2 are the trees that seem to be o.k. I would appreciate any advice you can give on how to care for these plants -- how often to water, etc. I'm a sucker for a free palm. I noticed my neighbour was cutting this Kentia back for removal. So I stepped in and opened my big mouth and said "I will remove it for you". Knowing full well that the neighbour was just going cut it up into manageable pieces for disposal. So here it is just under 1.5m tall. Access was a little limited, so not the root ball I was aiming for, but it will do. Plus We are heading into summer, and it's an El Nino cycle. The odds are not the great. I have several Kentias and have a recurring problem when the spikes turn to fronds. They develop about half way and then stop.....the individual leaves do not separate. My climate is hospitable here in SoCal, a mere 10 miles from the ocean so that is not an issue. I water them three times a week in hot weather and once a week in the winter. Any ideas as to the cause of this phenomenon ? Im new so I wanted to say hello. Anyways... Ive been determined to grow some indoor kentia / howea palms indoors. I transplanted some used palms but. Most of them died off and the ones that made it seem healthy yet stunted (fronds arent opening); I have since gotten some palm specific ferts and see if that helps them out (I wasnt gentle and shocked the hell out of them Im sure). So I ordered some Kentia seeds not thinking much about it. When I got them I read up about them and some people saying they wont germinate for 6 months to over a year... CRAZY. Tools: Utility Knife Tool (leatherman or equivalent), root hormone, ziplock bag, paper towels, decent soil preferably with earth worms, and a planter. 6) took another paper towel, folded it accordingly, wet it, then covered the seeds. So I essentially had a wet paper towel sandwich with seeds covered in root hormone in the middle. 9) woke up this morning and BAM a little seedling is popping out of the soil. I very gently dug down to make sure it was the Kentia palm seed and sure enough it was. One the reasons it took 2 months total is that I was initially trying things that didnt work which wasted a lot of time. What didnt seem to work: when I got the seeds I looked online and read that all I had to do was crack the hull off the seed then soak them for a few weeks. However, I dont think this much because the seed coating is so damn tough I doubt any water was activating the seed to germinate. This was a huge time waste.